I was out the door riding my bike with a small duffel bag on my shoulder at 5:15; inside the bag was a 40° sleeping bag, a change of clothes/gloves, a towel and a few toiletries - my drop bag that was destined for the Dimmick campground rest stop. At the check-in John Russel introduced himself and we had a short chat. It is great how randonneurs in the same geographic area all know about each other and eventually are able to put a face with the name. That is one of the good things of being involved in an activity that has yet to reach mass appeal. I could see Greg in front not too far away, I caught up to him and then other riders joined us. The group rode mostly together to Point Reyes Station where we split out according to food needs. Some riders went to the Bovine bakery while the rest of us went to the supermarket across the street. I was the first one out but it didn't take long to be joined by others. The group lead by Vidas P. and Richard M. moved ahead while I stayed a little behind. I did not have the climbing legs today, a bad sign this early in the ride. Greg and I rode together to Petaluma where we stopped at the Peet's Coffee, a new "approved" control. Chris B. was there and left before us. Our stop was quick but not lightning fast. Still, as we found out a little later, we were a little faster than some of the lead riders (except Chris). 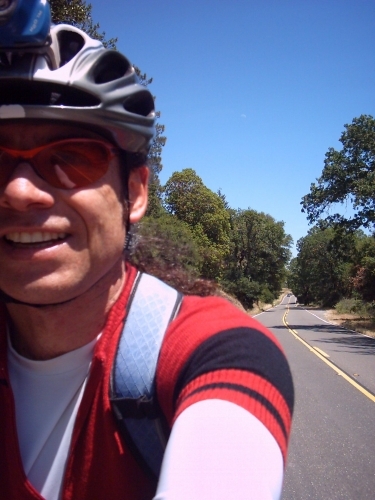 We had moved ahead of them while they had chosen Safeway as Control; they reached us and then we all rode together to Healdsburg, Jeff H, Vidas P., Richard M., Greg B. and I. I was feeling ok but there was no inspiration in my pedaling, just moving. Leaving Healdsburg we acquired new riders into our group, Brian C. and others, can't remember exactly who joined us but we were now maybe 8 riders. The pace was not hard, but there was little conversation unlike other groups where there is more time to socialize, this was more a business affair. Just before Geyserville somebody (perhaps Brian) called "glass! ", sh&*!, I rode right over it and hoped for the best. But just as I was at the back of the paceline my rear tire got flat. I called my flat, Vidas, in front of me, acknowledged and asked if I had everything and the group kept moving. The next lonely miles to Cloverdale were pleasant. I stopped at the same gas station mini-mart where we had stopped on the recent 400k and grabbed some cheese and jerky combo and something to drink. I noticed I was not drinking enough. Leaving Cloverdale, at the edge of town where the route turns left to follow hwy 128 up, I saw the distinctive bright backpack of Greg in the distance. The group had stopped at a motel to check out a room for the return. I caught up with them, but on the steeper part of the hill I dropped back a bit, no inspiration on the legs. This road has very nice views and the traffic is not too heavy. I had fun descending the steep and long section that follows the intersection of 128 @ House Mountain, however, I was very aware of the first law of cycling, all that rides down has to climb up sometime. The road was now a series of rollers, some longer or steeper. I could not see any riders in front or behind me. I was tired, but was having a good ride. Cows and plenty of farm dogs all cheered me as I rode by, as usual I thanked them. By Boonville I was getting ready to stop for a short break. As I rolled down into a small supermarket the group I had been riding with was getting ready to leave, Greg asked me if I needed to stop or if I could go right then. I was feeling fine, not particularly strong, but fine so I decided to go. We rode to the Dimmick campground stop to find the SRCC and had the funnest most luxurious stop I could have hoped for. I think we were some of the fist riders there, if not the first. They welcomed us with a smoothie and offers of either P&J or ham sandwiches. It was great to have a cheerful group staffing that stop. I have had two experiences with eh SRCC crew and they have exceeded my expectations both times, I am very grateful for their efforts. There was music, plenty of food and friendly conversation, SRCC: thank you, thank you! We were on the way the Ft Bragg, Hwy 128 was flat to the intersection with Hwy 1. Last time I rode a bicycle in that location was a while back when I did my Seattle to San Francisco solo tour, that intersection brought back good memories. 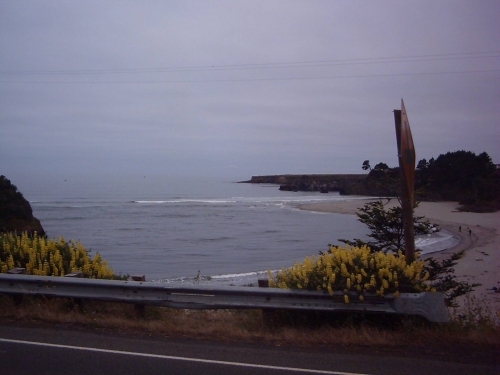 Highway "Uno" climbs from the bottom of a cove to the top of a the cliff and stays above it for the way to Ft Bragg. 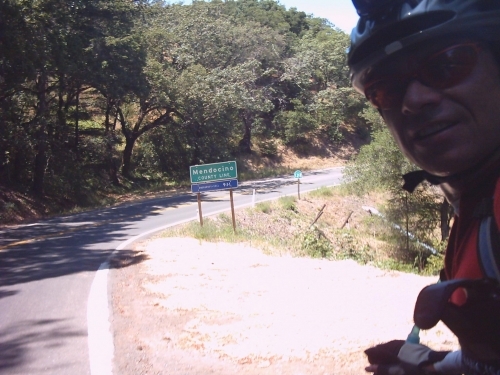 The miles to Mendocino and its expensive B&B's are full of rollers and beautiful hills and cliffs. After that it's not as easy on the eyes, but definitively easy on the legs. When I got to the turn around Control at the Ft Bragg Safeway the group was there, they had just purchased their food and were on the way back inside to park the bicycles by the bakery area where there was enough room for all of us and our toys. They left before me, when it was my turn to leave Albert K. was also ready to go. Willy N. had just arrived and had a broken rear fender that was rubbing against the tire. He was going to remove it and leave the broken pieces behind. Rob H., Bruce M., and Bruce B. had also just arrived. Albert and I rolled out, but not for long. There was still light out but I turned my taillight on and after a couple of miles I noticed the batteries on my taillight were very low so we stopped to replace them. I had tested them at home but apparently did not do a good job. Back rolling after two minutes. I had never met Albert before so we had something to chat about. Got to the campground where we were received this time with offers of pasta with meat sauce or veggies, I went for the meat kind. Greg, Jeff and the rest of the group ahead of us was there having their share of food. The campground had sleeping quarters in the form of two thick queen sized air mattresses and a single cot. I changed into dry clothes and discussed with Albert if I was ready to go right away. I decided I needed a little more time to rest, Albert went out alone. Christian F. and Mark E. came in and I asked them how long they were planning on staying, 10 minutes, I asked Christian if he would mind getting me when they were ready to; I went to lay on a mattress while I waited and found Rob and the two Bruces already sleeping, there was still room for at least two more bodies there so I temporarily took the place of one. When my time resting was up Christian came to get me. We left and lost Donald M. after a few miles. The hills split us up even more. By the town of Yorkville (I think) we caught up with Albert and then I dropped. The road was nice dark and quiet. I stopped at the top of the last hill to put on a vest and neck gaiter, it was very misty and cold on the downhill to Cloverdale. Once into town McDonald's sounded good, I went straight there but at about 3 am it was very closed so I looked over to the gas station across the street where I had stopped earlier the day before. Christian, Mark and Albert where there. I could not go with them, I needed a rest. After a few good-luck exchanges they left. While sitting on the floor of the front porch of the store I quietly enjoyed a hot beverage from the coffee machine and some of the unfinished potato chips they had left behind. A lady delivering newspapers in a small SUV parked just outside and left the engine running the doors wide open and the car stereo playing Spanish music, the kind my mom and dad used to listen to. The melody took me back many years to another country, Colombia where I was born. I thanked the lady -in Spanish of course - for the serenade, she was a little pleasantly surprised by my comment. After 20 minutes I was good to go. The short trip to Healdsburg was extremely nice. Quiet, mild temperature and peace inside, even though I was tired I was having a great time. I thought to my self this is what randonneuring is all about, then I said it out loud. 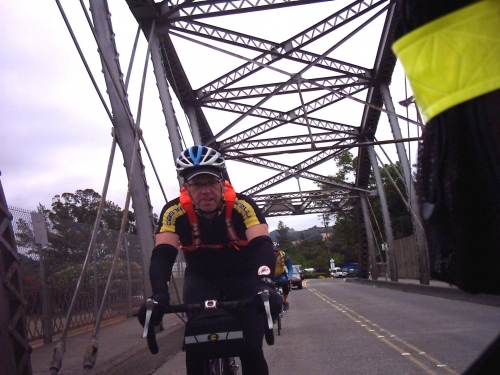 On the return leg, the Safeway at Healdsburg was not a Control but I stopped there anyway. I sat at the same picnic table as the day before and ate some peanuts that I had. After a good 10 minutes it was time to leave; as I was leaving the parking lot I saw two randonneurs go by. I caught up with them, it was Greg and Jeff! They had used the room Jeff reserved in Cloverdale for a quick couple of hours rest. I tried to keep up with them but did not want to fade on the effort so before getting to the intersection of Hwy 116 I slowed down and saw their tail lights disappear. When I got to the Guernville's Safeway Control they were there. We sat at the tables next to the Starsucks inside and finished our food. I asked them if they were waiting for me, they were, but again I was too tired to go at that moment so I told them to go ahead. Greg mentioned that the store at the next control in Marshall would be closed so it wouldn't matter if we rode slow. I was really tired and did not want to slow them down. So I insisted they go without me. Greg had the new cue sheet that Rob had sent the night before the event, the cue sheet with the corrections to the route. I wish I had gone with them. I could not remember how far the turn into Bohemian Hwy was. The cue sheet had a figure but it seemed too short so I stopped on 116 to double check my memory against the cue sheet. My trip mileage was 295 miles. I pressed the wrong button on the cycle computer and reset the trip distance and time, duh! I decided to trust the cue sheet and moved on in the same direction. Then I remembered a store were we had stopped last year with Zack K. and Veronica T. for coffee on the Russian River 200k, that store was definitely as far as the cue sheet indicated. Bohemian Hwy moves across a forest and its many turns keep the eyes from wandering too far ahead. The first part is almost flat but has a constant grade that later becomes steep at sections. Right before Occidental my legs were suffering a little. After Occidental I descended as fast as I could, not touching the brakes at all into a lovely valley. Again I had to stop to confirm I was on the right road. I was going to familiar Valley Ford on unfamiliar roads, out went the GPS enabled phone, I could not get gmaps to completely load but just a highlighted road with no names or map on the background; it indicated about 5 miles from where I was. I continued on this valley and then turned into Bodega Hwy (I think) passed Firestone and then up a hell of a steep hill. I took the left as per the cue sheet and rode immediately down on the steep road. When the road leveled and I was able to take my eyes from the road, I had my doubts about being on the route but still rode a few more miles before I decided to stop and check the phone again. This time gmaps loaded and presented me with the bad news, I had taken the wrong turn way back when I started descending, Sh*&! I was very close to Sebastopol and had added at least 10 miles! As mad at myself as I was I had plenty of adrenaline going and tried to recuperate the lost time, but the hill won the battle. It was freaking steep and should go on my books as one of the worst wrong turns ever. Once up there on the right track to Valley Ford I laughed at my stupidity and apologized to the body for the mistake the mind had made. When I passed trough Tomales I think I saw Albert's bike parked outside the bakery but I did not want to stop there. A few miles ahead I stopped at a port-o-potty that is in the dirt parking lot of a park. The next miles were the very familiar rollers leading to Marshall. There were no bikes outside of the Marshall store, that was a first for me during a brevet. I went inside and had a small serving of clam chowder, I don't care for it but the body needed soup of any kind. I asked the girl at the counter how many cyclist had stopped here before me, "none so far today". I guess all riders got here before it opened so they had to send a postcard from the post office across the street to satisfy the control requirement. That was it, I was on the home stretch! Tired as I was I rode to Platform bridge at Point Reyes Petaluma Road where I stopped yet one more time to eat something and have an energy gel. I was there for a good while recuperating my energy. At Nicasio I stopped at the restroom and then bought something to drink at the store. A rider was sitting outside on the bench eating a sandwich, we talked a little about my ride so far then I moved on. At the top of the Nicasio hill I stopped for a photo. I had been so tired during the day so far that I had forgotten to take pictures. At that moment the same rider I was chatting with before stopped and offered to take my photo. Once back in the civilized world of SUVs and diet drinks I called my lovely wife announcing I would be arriving soon. The last two hills of the day, Camino Alto and then Sausalito to the Golden Gate Bride where all brutal, all riders except tourist passed me as if I was walking. The wind was blowing strongly but once on the bridge deck I was on a mad mission to cross it as fast as I could. I passed a few riders and rode into the finish where the always welcoming Mark B. congratulated me and cheered me on. Thanks Mark. 2:55 pm Sunday sunny afternoon. I stayed there for a while and asked all the usual questions, when had my friends come in, at what time did the first riders arrive, etc. In return Mark asked about my trip. John C. arrived to relieve Mark from his shift but Mark was going to hang around for a while. I told them that I thought I would be the last rider to arrive for a while, out of the bunch that had decided not to sleep. All others would probably be starting to arrive within a couple of hours. This time I did not drink Gatorade and although plain water tasted better in the middle of the night I think the extra junk in Gatorade makes a difference for the better. Food was an issue. I think I did not eat enough and not the right stuff. This route is very tough, the climbing totals don't really make it justice to the steep, and sometimes frequent rollers, also the steeper sections are done on the return when the legs are tired. It seems I turned off the GPS at the Safeway in Ft Bragg when I took it out of the pocket to check if it was working fine. Sure it was working fine until I touched it! I wish I had the whole thing recorded to show me the path I took when I got lost. The SRCC deserves an award for the Christmas like lights decoration, lawn chairs, air mattresses... too many nice things to list here. They deserve my most sincere THANKS. 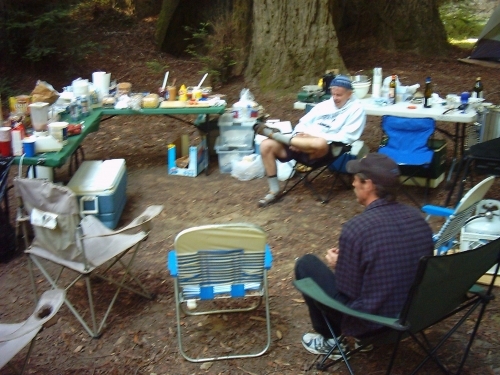 However I hope we (San Francisco Randonneurs) don't start offering excessive creature comforts, I like the unsupported nature of our events during the ride; I rather have comfort/socializing at the end. For now I don't see a 1200k in my future. I think the sweet spot brevets, on paved roads, are 360-400k. They offer the perfect combination of accomplishment vs fun/mile.